Here’s a recipe to celebrate the first day of summer. The day the sun is so high it appears to stand still; the longest day in the Northern Hemisphere. 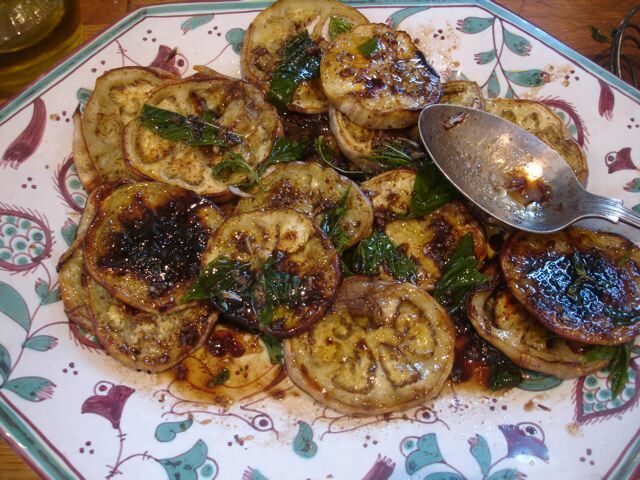 Roasted Aubergine [eggplant] slices with Feta and a mint vinaigrette. I used the purple speckledy ones this time. Heat the oven to hot–240C/450F. Lightly brush the aubergines slices with olive oil. Cover shallow oven trays (you may need two or to repeat the process) with foil. Brush the foil with oil to prevent the slices sticking. Spread the slices on the trays. 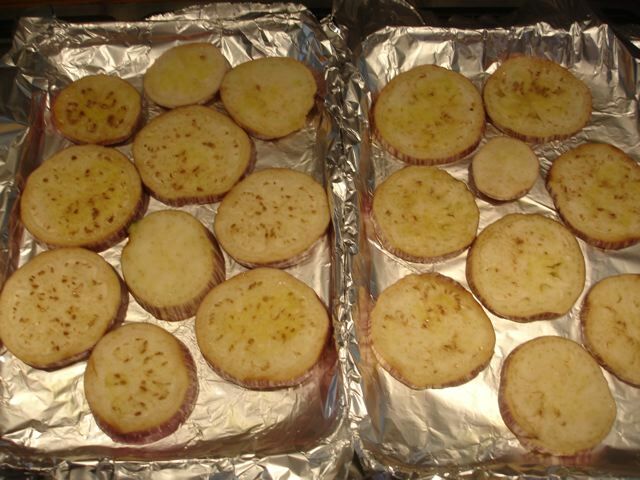 Take them out of the oven and spread them on a serving plate. Whisk the vinaigrette ingredients together and pour it over the slices while they are still warm. Flake the feta–if you are using it– over the top. Serve at room temperature–leaving a little time for the flavours to meld. * alternatively, you could griddle the slices–which gives them a slightly smoky taste. Hello Mereidith & Robin – you really know how to cheer a body up,its been raining on and off all day here, but you made me laughed when I read your song, and see what you meant about the seventh line -so thank you for cheering up a bad day. Grilled is also good, especially on the embers…. I don’t explain exactly, but like you cook the steak-fiorentina. I love aubergines cooked like that Robin, and without feta-cheese, is the same an old sicilian’s recipe, cooked by my father-in-law. Thanks, love Bea. Robin, your recipe sounds lovely! I think it will be helpful in my quest to learn to like eggplant. 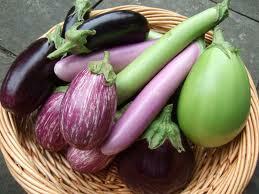 (Aubergine is a much prettier name, isn’t it?) And the song you shared with us is a hoot! 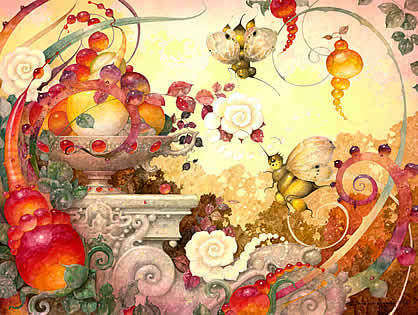 Again, many thankyous for your delightful posts. You and Meredith seem like such kindred spirits.